Powers/Abilities: Though they were green-skinned and clearly alien in appearance, they were similar enough to humanity that Earth would be considered an ideal world for them. 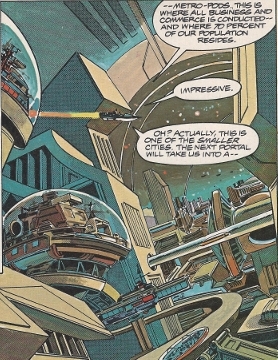 They were, however, far more technologically advanced then humanity, able to create a space station and from that the immense Ark (allegedly a light year long -- see comments), airships, laser pistols for conventional military use, a fusion vortex able to span two black holes, skimmers for traveling among the pods, and a hologram proscenium. Presumably via technology, but possibly via their own abilities, they could read the thoughts of others, which was most easily done when the target was sleeping. Presumably via the same fashion, they could learn languages within a very short time by scanning others' thoughts. They could also either create illusions or physically alter the forms of themselves and other living beings or technology. They typically referred to these changes as "smoke" - real things and real people disguised (in the case of Star-Lord) for familiarity to his eyes, as the reality was alien and likely repugnant to him. "Smoke" was used to make the Dwellers appear human, the animals in the wildlife preserve appear like terrestrial animals, and (based on a confusion of fact and fiction from reading Star-Lord's memories) the "bullfinches." It was not confirmed whether the "smoke" was technologically-based or via mental or physical powers of the Dwellers, though each Dweller's form was under that person's conscious control. Traits: The Dwellers viewed themselves as superior (not technologically so) to others (or at least of humanity). While many were content with their existence on the Ark, a militant faction (formerly led by "Noah") sought to claim another planet for themselves, even if they had to take it from another race. The Dwellers were divided up geographically within the pods in the Ark, and the pods were largely separated based on desired function/environment, as well as the occupation and/or lifestyle of those dwelling there. Confirmed occupations included artisans, farmers, keeper ecologists, scientists, and soldiers. The Dwellers had their own language, though they could speak other languages after scanning the thoughts of anyone speaking another language. (Marvel Super Special#10 (fb) - BTS) - Over 3 million years ago (see comments), a technologically-advanced race detected the eventual arrival of a meteor storm that might destroy their planet. From a space station, they began construction of an immense space ark, which might become the new home to their population. (Marvel Super Special#10 (fb)) - <According to "Noah"> 3 million years ago, a rain of meteors pounded the race's planet for 40 days (see comments). The (surviving?) 2 billion residents made a mass exodus to their space station, where their workers worked to complete the Ark that had been "so long in the making." Finally completing the Ark, which was allegedly a full light year long, the 2 billion natives disembarked, destroying the space station in the process, while at the same time, their planet was reduced to rubble and joined the meteor storm, hurtling off to destroy some other world. (Marvel Super Special#10 (fb)) - Maintaining their population numbers exactly through careful planning, the Dwellers of the Ark began a quest for a new homeworld, an uninhabited planet with a suitable environment. In 3 million years, however, they located only 19 planets with acceptable ecospheres, but all were already inhabited. Though they continued their search, the Ark became their ecosphere, their nomadic world perpetually floating through space on a quest very probably without end. (Marvel Super Special#10 (fb) - BTS) - Most of the Dwellers accepted the Ark as their home, the only one they had ever known. However, some of the military, including their leader, a man who would become known as "Noah," resolved that if a suitable uninhabited planet could not be found, they should take the best inhabited one. (Marvel Super Special#10 (fb) - BTS) - Noah and his followers took over the Ark in a slow military coup, and eventually the People eventually ceded rule to the military via majority vote. With the military now possessing both leadership and all of the weapons, the majority of the People had no way to oppose them. (Marvel Super Special#10 (fb)) - Somehow learning of Earth, Noah and his followers determined it to be the best suitable planet offering the least resistance. They believed it would be susceptible to slow integration and absorption by the Ark's people, first as homeless friends from the stars, and then as gradual conquerors from within, through increasing assertion of what they believed to be their superiority, until Earth was theirs and the Terrans were slaves without realizing it. (Marvel Super Special#10 (fb)) - Further learning of Star-Lord (Peter Quill), the Dwellers of the Ark resolved to study him to learn of Earth without contacting and alarming the Terrans. With Quill's cosmic experience, they believed he would be prone to believing and sympathizing with stories they might tell him. While the Noah and his followers wished to use Quill to conquer Earth, some of the military (including Aletha) rebelled and allied with the Artisans and other common people. The rebels wanted Quill to help them overthrow the military so they could remain peacefully on the Ark. (Marvel Super Special#10 (fb)) - To bring Star-Lord to them, Aletha manufactured an artificial fusion vortex by moving two stars into either end of a black hole. Rather than adding to the black hole's anti-matter mass, the first collapsing star collided with the incoming matter (or anti-matter) of the other collapsing star from the black hole's other end. The substance of both stars, having collided at the very heart of the black hole, was then spit out in some sort of whirling vortex, a pipeline to bring Star-Lord to them. (Marvel Super Special#10) - As a weary Star-Lord prepared for rest aboard his companion, Ship, the Dwellers of the Ark made contact, and Ship claimed to be possessed, causing her to speak in a dark and threatening form. The fusion vortex then struck Ship, burning through her hull and apparently leeching her life force. Just before the vortex pulled Star-Lord into it, Ship revealed that it originated from a black hole in the 5th quadrant. After traveling through the center of the pipeline/vortex (passing through the black hole), Quill decided to exit the pipeline, and he rupture it with a water-stream from his Element Gun. Escaping the pipeline just a short distance from the Ark, Quill was shocked by its immensity, but was snared by smaller tentacles extending from the pipeline and pulling him back inside; he was rendered unconscious. (Marvel Super Special#10 - BTS) - Quill arrived within the Ark, and his unconscious form was transported to a jungle pod. The Dwellers' technology probed Quill's mind, but there was not time to separate fact from fancy, and as a result, they created illusions of "bullfinches," which were very similar to the griffins Quill had read of in Bullfinch's mythology text. Either now or some time earlier, the Dwellers adopted forms identical to humanity. (Marvel Super Special#10) - Awakening, Quill was assaulted by a pair of bullfinches, and was saved by a tranquilizer dart fired by Aletha. Before she could tell him anything, "Noah" arrived with a group of soldiers, who identified the creatures as "bullfinches." As Aletha slipped away unnoticed, Noah introduced himself and explained that Quill's final firing of his weapon ruptured one of their locks and sent him into a sector off-limits to all but the keeper-ecologists, who had to take extraordinary precautions. Noah further explained (falsely) how they had nearly been sucked into this side of the black hole, but had managed to match its pull with a thrust of retro-energy around its periphery, which created the red vortex. Noah apologized for the inconvenience, then explained the enormous stellar energy they had absorbed over their 3 million year trek, which allowed them to keep the black hole at bay and to disengage from it. Though distraught over the loss of Ship and his semi-traumatic journey, upon seeing Aletha named as his guide, Quill agreed to Noah's request to go to his quarters to rest, and they would answer all of his questions the next day. Aletha told Quill they couldn't talk just then, but might be able to during the next day's tour. Quill dreamed of his history and origins as Star-Lord. 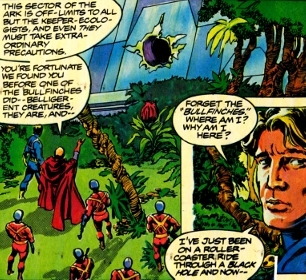 (Marvel Super Special#10 - BTS) - Quill's dreams were guided and reviewed by the Dwellers, learning much of Earth, as well as of their error with the "bullfinches." 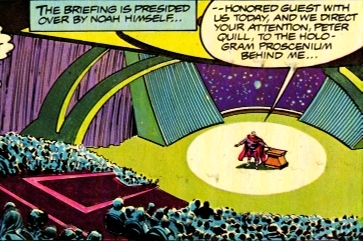 (Marvel Super Special#10) - The next day, aided by a hologram proscenium, Noah shared a (presumably somewhat altered) history of the origins of the Dwellers of the Ark and the loss of their world. Aletha then took Quill on a skimmer to tour the Ark, during which time he sympathized with the Dwellers of the Ark, conceiving that a similar fate might happen to Earth someday. When they entered one of only 10 wildlife preserves, Quill was stunned by the terrestrial animals, and Aletha and the skimmer's pilot explained that the Dwellers of the Ark were actually from Earth, which had perished sometime after Quill had been pulled into the vortex/pipeline, which was a space-time conduit; they further noted that the "bullfinches" were long-abandoned genetic engineering experiments. Quill was devastated by this information, but Aletha subsequently gave him a note, in an alien language that his Star-Lord abilities allowed him to read, stating "We are not what we seem. Meet me for a creative vacation at the waterfall after nightshift." After the lights darkened, Quill returned to the pastoral-pod housing the waterfall, where Aletha revealed that, while the meteor-storm origins were true, the Dwellers of the Ark were from a different world than Earth. As Aletha revealed the full nature of the duplicity and the People's true current status and motivations, she explained the appearances of the chambers, including the Earth-like flora and fauna were "smoke" -- real things and real people disguised for familiarity to his eyes, as the reality was alien and likely repugnant to him. Aletha convinced Quill to aid her cause, as well as to love her (as there was just enough time for that); he agreed to do so even when she dropped the illusion to take her true form. Meanwhile, the men monitoring Quill realized he was out of his room and alerted Noah after Quill. Soon their computers alerted Noah that all residencies in the Z-9 Artisan sector were uninhabited. Noah mobilized all Z-10 fighters to investigate the Artisan sector. After the fighters departed, however, Noah's command post was surrounded by a mob of common people. Noah ordered the fighters to swiftly take out the Artisans and then return to secure the post. Aletha brought Quill to the gathered rebellion, who cheered Star-Lord as their commander even as they returned to their true forms. Before Quill could even formulate a plan, Noah's sky-fighters arrived, and Aletha asked Quill to bring them down from the sky so her people could overwhelm them. Though Quill urged a peaceful resolution, Aletha swiftly convinced him Noah's soldiers would kill them all. Quill made one final attempt to reason with a pilot, who blew up his own ship in a failed effort to destroy Star-Lord. 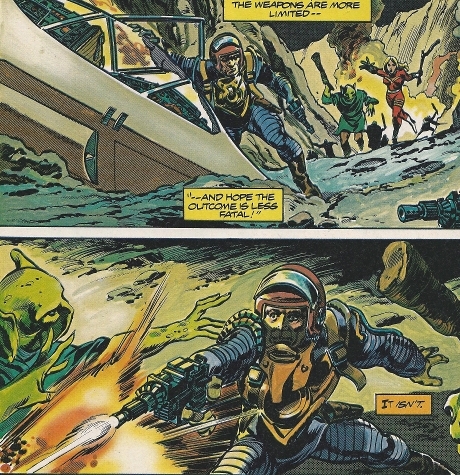 Quill therefore used his Element Gun to disable the ships' laser cannons and force the ships to the ground, where soldiers with laser pistols began blasting the rebels, armed only with sticks and other blunt weapons. Disgusted with the slaughter, Quill put aside his vow of peace and proceeded to blow up each of the ships in the fleet. At the same time, the rebellion swarmed Noah's control center, commanding Noah to drop the illusion and return to his true form, as they did. Noah surrendered, and the rebels thanked Quill for leading to victory. Aletha led Quill back to the waterfall where she admitted to having help from "his side" in bringing him to the Ark, after which she explained that he had to leave as he could not be limited to a single world, even one as large as the Ark. Quill reunited with Ship, learned of her involvement, and headed out into space. Comments: Created by Doug Moench, Gene Colan, and Tom Palmer. "Noah" described the Ark as "so long in the making" - whether it took a few years, or decades, centuries, millennia, etc. is unrevealed. I think the Chenom would be a good name for this race, or, at least, their planet. 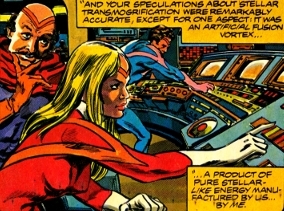 I don't know if the Dwellers of the Ark originated in the universe of Earth-791 or whether they were from some dimension still associated with Earth-791's reality... Ship mentions it as originating in the "5th quadrant," which would seem to be a designation in the same universe (or galaxy), from which they were then based...EXCEPT quadrant would seem to mean 4 parts, and 5th quadrant might imply something beyond regular space. It is not clear whether the reference by "Noah" of the meteor storm lasting for 40 days was historically accurate, or whether it was just a reference to try to play on the whole Noah and Ark thing to make them seem more familiar to Star-Lord. A discussion by Aletha shows a glimpse into Earth-79120, where the Dwellers of the Ark conquered Earth. We don't know how long the construction of the Ark took, but they started it after foreseeing the meteor storm and completed it as the storm started (not sure why the meteors didn't hit the "light year long" Ark). The storm was around 3 million years ago (unless that was part of the past Noah distorted in the telling), but it may have taken them a year, a decade, a century, or a millennium or more to complete an Ark this size. All we know is that the Ark was "so long in the making." It is similarly not clear whether the race had 2 billion members, or whether only 2 billion (some fraction of the unrevealed whole) survived the meteor storm and escaped aboard the Ark. Given the Ark was allegedly a light year long, certainly space on the Ark would not be a limitation, but perhaps transport off the planet in a timely fashion was? We'll probably never know. (Marvel Super Special#10 (fb) - BTS) - Over 3 million years ago (see comments), a technologically-advanced race detected the eventual arrival of a meteor storm that might destroy their planet. From a space station, they constructed an immense space ark, which might become the new home to their population. (Marvel Super Special#10 (fb)) - <According to "Noah"> 3 million years ago, a rain of meteors pounded the race's planet. The (surviving?) 2 billion residents made a mass exodus to their space station, where their workers completed the Ark that had been "so long in the making." Finally completing the Ark, which was allegedly a full light year long, the 2 billion natives disembarked, destroying the space station in the process. (Marvel Super Special#10 (fb) - BTS) - The Ark was divided into a series of numerous pods, based on the activities, occupations, and/or nature of those living and/or working within each pod. Among these pods were hydroponic farrms, jungle pods, metro-pods, pastoral-pods, military pods, and wildlife preserve pods. There was additionally an Artisan sector, though the size and extent of that was unrevealed. At least a portion of that sector was designated Z-9. The Dwellers traveled between pods via skimmers, though it would seem teleportation would be needed to cover significant distances within the Ark due to its immense size. It would also seem that the pods seen or mentioned were a tiny fraction of those present on the immense Ark. (Marvel Super Special#10 (fb)) - As efforts to find a habitable, yet uninhabited planet to take as their own proved fruitless, the Ark proved a long-term acceptable ecosphere for its dwellers, though the nomadic world continued its quest through space. (Marvel Super Special#10 (fb) - BTS) - Most of the People accepted the Ark as their home. However, some of the military, including their leader, later known as "Noah," resolved that if a suitable uninhabited planet could not be found, they should take the best inhabited one. (Marvel Super Special#10 (fb) - BTS) - Noah and his followers took over the Ark in a slow military coup, and eventually the People eventually ceded rule to the military via majority vote. (Marvel Super Special#10 (fb)) - Further learning of Star-Lord (Peter Quill), the Dwellers of the Ark resolved to study him to learn of Earth. While the Noah and his followers wished to use Quill to conquer Earth, some of the military (including Aletha) rebelled and allied with the Artisans and other common people. The rebels wanted Quill to help them overthrow the military so they could remain peacefully on the Ark. (Marvel Super Special#10 (fb)) - To bring Star-Lord to them, Aletha manufactured an artificial fusion vortex. 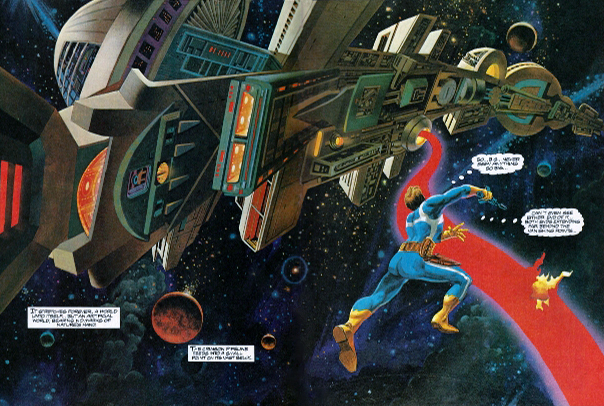 (Marvel Super Special#10) - The fusion vortex struck Ship and pulled Star-Lord to the Ark. (Marvel Super Special#10 - BTS) - Quill arrived within the Ark, and his unconscious form was transported to a jungle environment. (Marvel Super Special#10 - BTS) - While Quill slept, Ship was pulled through the vortex as well. As her damaged form healed within a grotto hidden by a waterfall in a pastoral pod within the Ark, her mind at some point linked up with Aletha's. (Marvel Super Special#10) - Awakening, Quill encountered Aletha and Noah, the latter of whom adjusted the lighting to day with a verbal command, then introduced himself. Though distraught over the apparent loss of Ship and his semi-traumatic journey, upon seeing Aletha named as his guide, Quill agreed to Noah's request to go to his quarters to rest, and his assurance that they would answer all of his questions the next day. (Marvel Super Special#10) - The next day, aided by a hologram proscenium, Noah shared a somewhat altered history of the origins of the Dwellers of the Ark and the loss of their world. Aletha then took Quill on a skimmer to tour the Ark, during which Quill was deceived into believing the Dwellers were originally from Earth. Aletha subsequently revealed the truth and convinced Quill to help overthrow Noah and the military rule, so that the Dwellers could remain on the Ark, which Quill did. Quill was subsequently reunited with Ship, and the two departed the Ark. It was the residents of the Z-9 Artisan sector who formed the rebellion. Their absence from their living quarters alerted Noah's forces, who sent troops to investigate. The Ark was divided into a series of pods housing different environments. There were 5000 hydroponic farms, located at intervals throughout the Ark and cultivated by the common people; solar panels span the pod's mile-high "roof," and the chamber even has its own clouds for controlled rainfall and optimum yield. Most of the Ark's food is synthetically processed, so the farm-pods aren't really necessary, but many of the people still occasionally enjoy the taste of "real thing." 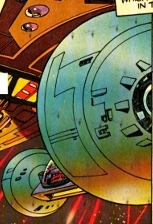 Guided by Aletha and accompanied by a soldier presumably loyal to "Noah," Star-Lord (Peter Quill) toured one of the farm pods aboard a skimmer (also seen in this image) during his brief visit to the Ark. (Marvel Super Special#10 - BTS) - Star-Lord (Peter Quill) arrived within the Ark, and his unconscious form was transported to a jungle pod. The Dwellers' technology probed Quill's mind, but there was not time to separate fact from fancy, and as a result, they created illusions of "bullfinches," which were very similar to the griffins Quill had read of in Bullfinch's mythology text. The Dwellers adopted forms identical to humanity. (Marvel Super Special#10) - Awakening, Quill was assaulted by a pair of griffin-like creatures, and was saved by a tranquilizer dart fired by Aletha. Before she could tell him anything, "Noah" arrived with a group of soldiers, who identified the creatures as "bullfinches." As Aletha slipped away, Noah introduced himself and explained that Quill's final firing of his weapon ruptured one of their locks and sent him into a sector off-limits to all but the keeper-ecologists, who had to take extraordinary precautions. Guided by Aletha and accompanied by a soldier presumably loyal to Noah, Quill toured one of the jungle pods aboard a skimmer during his brief visit to the Ark. Obviously the "Bullfinches" were illusory (or something like that), but it is unrevealed whether anything else seen in the jungle pod was false. There were 12,000 metro-pods, where all business and commerce is conducted, and where 70% of their population resides. The military-pods were a combined barracks and hangar community. This is where Aletha lived. Some military pod and/or sector was designated Z-10. Noah mobilized all Z-10 fighters to investigate the Artisan sector when the residents of that sector were out of their quarters and gathering to join with Star-Lord in a rebellion. Guided by Aletha and accompanied by a soldier presumably loyal to "Noah," Star-Lord (Peter Quill) toured one of the farm pods aboard a skimmer (seen above the military craft on the ground) during his brief visit to the Ark. The pastoral pods are where most of the artisans (musicians, writers, artisans) choose to dwell; the rest of the population enjoys vacationing there. At some point, Ship arrived on the Ark as well, and she was taken to a grotto beyond the waterfall in a pastoral pod for repairs. 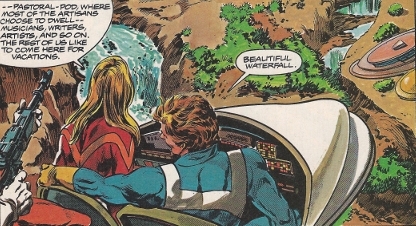 While touring that same pod, Star-Lord (Peter Quill) was immediately impressed with the beautiful waterfall, and this is where Aletha arranged to meet Quill to reveal the true nature of the Dwellers of the Ark and to convince him to help the rebellion overthrow Noah's regime. They had a romantic interlude there, after which Aletha introduced Quill to the rebellion. Noah's soldiers attacked them there in jets, but Quill eventually destroyed the entire fleet. There are allegedly only 10 wildlife preserves. 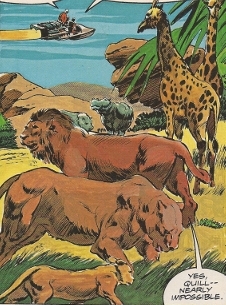 When Star-Lord (Peter Quill) visited, the animals were disguised by the illusory "smoke" to appear as terrestrial animals, part of the plot to make Quill believe the Dwellers of the Ark were originally from Earth. Quill was stunned by the "revelation." (Marvel Super Special#10 (fb)) - The Dwellers of the Ark resolved to study Star-Lord (Peter Quill) to learn of Earth without contacting and alarming the Terrans. While "Noah" and his followers wished to use Quill to conquer Earth, some of the military (including Aletha) rebelled and allied with the Artisans and other common people. The rebels wanted Quill to help them overthrow the military so they could remain peacefully on the Ark. (Marvel Super Special#10 (fb)) - Aletha conceived of, manufactured, and activated an artificial fusion vortex, a pipeline to bring Star-Lord to them. (Marvel Super Special#10 - BTS) - Quill arrived unconscious within the Ark's jungle environment. 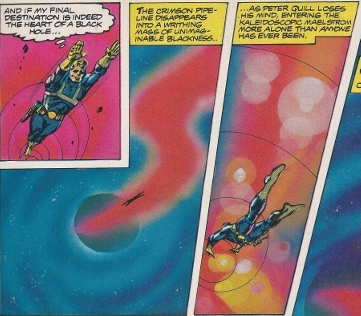 (Marvel Super Special#10 - BTS) - While Quill, Ship was pulled through the vortex as well. As her damaged form healed within a grotto hidden by a waterfall in a pastoral pod within the Ark, her mind apparently linked up with Aletha's. (Marvel Super Special#10) - Awakening, Quill was assaulted by a pair of griffin-like "bullfinches," and was saved by a tranquilizer dart fired by Aletha. Before she could tell him anything, "Noah" arrived with a group of soldiers, Aletha slipped away, apparently undetected by Noah. Later, though distraught over the loss of Ship and his semi-traumatic journey, upon seeing Aletha named as his guide, Quill agreed to Noah's request to go to his quarters to rest, and they would answer all of his questions the next day. Aletha told Quill they couldn't talk just then, but might be able to during the next day's tour. (Marvel Super Special#10) - The next day, after Noah shared a somewhat altered history of the origins of the Dwellers of the Ark and the loss of their world, Aletha and a pilot then took Quill on a skimmer to tour the Ark. 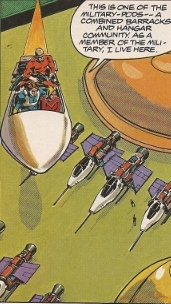 They traveled through a hydroponic farm, a metro-pod, a pastoral-pod, a military pod, and a wildlife preserve pod, during the latter of which Quill's recognition of the terrestrial animals caused the other soldier on the skimmer to explain (falsely) that the Dwellers of the Ark were actually from Earth, which had perished sometime after Quill had been pulled into the vortex/pipeline, which was a space-time conduit. Quill was devastated by this information, but during the return to his quarters, Aletha gave him a note, stating "We are not what we seem. 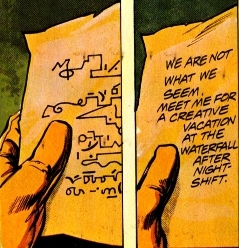 Meet me for a creative vacation at the waterfall after nightshift." Quill returned to the pastoral-pod housing the waterfall, where Aletha revealed that the Dwellers of the Ark were from a different world than Earth. As Aletha detailed the nature of the duplicity and the People's true current status and motivations, she explained the appearances of the pods, including the Earth-like flora and fauna as being "smoke" -- real things and real people disguised for familiarity to his eyes, as the reality was alien and likely repugnant to him. Aletha convinced Quill to aid her cause, as well as to love her (as there was just enough time for that); he agreed to do so even when she dropped the illusion to take her true form. After their romantic interlude, Aletha brought Quill up the hill to the gathered rebellion. Before Quill could even formulate a plan, Aletha announced the arrival of Noah's sky-fighters and asked him to bring them down from the sky so her people could overwhelm them. Aletha swiftly convinced Quill there was no choice, or Noah's soldiers would kill them all. After even a gently downed fighter slaughtered the rebels with his laser pistol, Quill destroyed the entire fleet. At the same time, the rebellion swarmed Noah's control center, and Noah surrendered. Aletha led Quill back to the waterfall where she admitted to having help from "his side" in bringing him to the Ark, after which she explained that he had to leave as he could not be limited to a single world, even one as large as the Ark. Some of Ship's widgets appeared just seconds before Aletha collapsed, telling him to follow them. As Quill followed the widgets through the waterfall, a bluish glow surrounded Aletha; though he did not see that, Quill found a bluish glow surrounding Ship within a grotto beyond the waterfall. Ship revealed her being transported there as well and how she had been linked with Aletha throughout their adventures (or at least by the time of Quill and Aletha's romantic interlude). Aletha recovered and bade them farewell as Quill and Ship exited the waterfall and then the Ark, and headed out into space. Note: It's not clear to me exactly when Aletha and Ship linked up. Definitely before the romantic interlude, but quite likely as early as the Dwellers' initial contact with Ship. (Marvel Super Special#10 (fb) - BTS) - Most of the Dwellers accepted the Ark as their home, the only one they had ever known. However, the leader of the military, a man who would become known as "Noah," resolved that if a suitable uninhabited planet could not be found, they should take the best inhabited one. 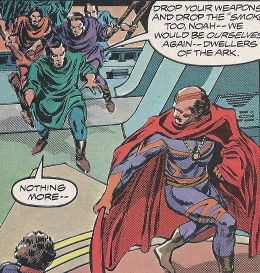 (Marvel Super Special#10 (fb) - BTS) - The man who would become "Noah" and his followers took over the Ark in a slow military coup, and eventually the People eventually ceded rule to the military via majority vote. With the military now possessing both leadership and all of the weapons, the majority of the Dwellers had no way to oppose them. (Marvel Super Special#10 (fb)) - Somehow learning of Earth, the man who would become "Noah" and his followers determined it to be the best suitable planet offering the least resistance. (Marvel Super Special#10 (fb)) - Further learning of Star-Lord (Peter Quill), the Dwellers of the Ark resolved to study him to learn of Earth without contacting and alarming the Terrans. Some of the military (including Aletha) rebelled and allied with the Artisans and other common people. The rebels wanted Quill to help them overthrow the military so they could remain peacefully on the Ark. (Marvel Super Special#10 (fb)) - Aletha conceived of and manufactured, and activated an artificial fusion vortex, a pipeline to bring Star-Lord to them. (Marvel Super Special#10 - BTS) - Quill arrived unconscious within the Ark's jungle environment. Presumably, as the Dwellers' technology probed Quill's mind, the military leader adopted the name Noah to remind Quill of the biblical Noah. (Marvel Super Special#10) - Noah and a group of soldiers arrived just after Aletha saved the awakened Quill from a pair of griffin-like "bullfinches" and slipped away. Adjusting the lighting to day with a verbal command, Noah then introduced himself and explained that Quill's final firing of his weapon inside the pipeline had ruptured one of their locks and sent him into a sector off-limits to all but the keeper-ecologists, who had to take extraordinary precautions. Noah further explained (falsely) how they had nearly been sucked into this side of the black hole, but had managed to match its pull with a thrust of retro-energy around its periphery, which created the red vortex. Noah apologized for the inconvenience, then explained the enormous stellar energy they had absorbed over their 3 million year trek, which allowed them to keep the black hole at bay and to disengage from it. Though distraught over the apparent loss of Ship and his semi-traumatic journey, upon seeing Aletha named as his guide, Quill agreed to Noah's request to go to his quarters to rest, and they would answer all of his questions the next day. Quill dreamed of his history and origins as Star-Lord. 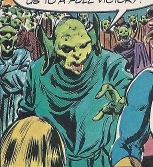 (Marvel Super Special#10 - BTS) - Quill's dreams were guided and reviewed by the Dwellers, who from them learned much of Earth. (Marvel Super Special#10) - The next day, aided by a hologram proscenium, Noah shared a somewhat altered history of the origins of the Dwellers of the Ark and the loss of their world. Aletha then took Quill on a skimmer to tour the Ark. When Quill was stunned by the presence of terrestrial animals, the the other soldier on the skimmer to explain (falsely) that the Dwellers of the Ark were actually from Earth, which had perished sometime after Quill had been pulled into the vortex/pipeline, which was a space-time conduit. That night, however, Aletha secretly met with Quill and revealed the truth, convincing him to lead the rebellion to overthrow Noah and the military rule. Meanwhile, Noah was alerted of Quill's prolonged absence from his room, as well as the subsequent absence of all residencies in the Z-9 Artisan sector. From his command post in Metro-Pod Z-8, Noah mobilized all Z-10 fighters to investigate the Artisan sector. After the fighters departed, however, the command post was surrounded by a mob of common people. Noah ordered the fighters to swiftly take out the Artisans and then return to secure the post. Unable to achieve a peaceful resolution, Quill destroyed the entire fleet to save the rebellion. At the same time, the rebellion swarmed Noah's control center, commanding him Noah to drop the illusion and return to his true form, as they did. Noah surrendered, and the rebels thanked Quill for leading to victory. Quill and Ship departed the Ark. (Marvel Super Special#10 - BTS) - Quill arrived within the Ark, and his unconscious form was transported to a jungle environment. The Dwellers' technology probed Quill's mind, but there was not time to separate fact from fancy, and as a result, they created illusions of "bullfinches," which were very similar to the griffins Quill had read of in Bullfinch's mythology text. The Dwellers adopted forms identical to humanity. (Marvel Super Special#10) - Awakening, Quill was assaulted by a pair of griffin-like creatures, and was saved by a tranquilizer dart fired by Aletha. Before she could tell him anything, "Noah" arrived with a group of soldiers, who identified the creatures as "bullfinches." (Marvel Super Special#10 - BTS) - That night, as Quill slept, his dreams were guided and reviewed by the Dwellers, learning much of Earth, as well as of their error with the "bullfinches." (Marvel Super Special#10) - During a tour of various pods within the Ark, a soldier told Quill that the "bullfinches" were long-abandoned genetic engineering experiments. Aletha later explained the truth about the bullfinches to Quill in the process of revealing the true nature of the Dwellers of the Ark. (Marvel Super Special#10 (fb)) - Aletha manufactured an artificial fusion vortex by moving two stars into either end of a black hole. Rather than adding to the black hole's anti-matter mass, the first collapsing star collided with the incoming matter (or anti-matter) of the other collapsing star from the black hole's other end. The substance of both stars, having collided at the very heart of the black hole, was then spit out in some sort of whirling vortex, a pipeline to bring Star-Lord to them. Aletha conceived the idea, made it workable, and activated it to seek the black hole, and thus Star-Lord. (Marvel Super Special#10) - As a weary Star-Lord (Peter Quill) prepared for rest aboard his companion, Ship, the fusion vortex struck Ship, burning through her hull and apparently leeching her life force. Just before the vortex pulled Star-Lord into it, Ship revealed that it originated from a black hole in the 5th quadrant. As he traveled down the vortex's pipeline/tentacle, Quill correctly speculated at its origins, though he didn't consider it might be artificially created. He further considered that Ship had not been possessed, but that the shock of the assault had deranged her, causing her to manifest her darker, repressed side. After traveling through the center of the pipeline/vortex (passing through the black hole), Quill decided he needed to exit the pipeline, and caused it to rupture by firing a water-stream from his Element Gun. He escaped the pipeline just a short distance from the Ark, and while he was shocked by its immensity, he was snared by smaller tentacles extending from the pipeline and pulling him back inside; he fired his weapon repeatedly, but was rendered unconscious. (Marvel Super Special#10 - BTS) - While Quill slept in the jungle, Ship was pulled through the vortex as well. 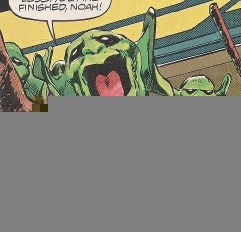 (Marvel Super Special#10) - Noah further explained (falsely) how they had nearly been sucked into this side of the black hole, but had managed to match its pull with a thrust of retro-energy around its periphery, which created the red vortex. Aided by a hologram proscenium, Noah shared a somewhat altered history of the origins of the Dwellers of the Ark and the loss of their world. (Marvel Super Special#10 (fb)) - Somehow learning of Earth, Noah and his followers determined it to be the best suitable planet offering the least resistance. 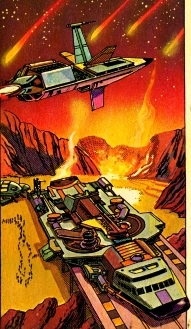 (Marvel Super Special#10) - From his command post in Metro-Pod Z-8, Noah learned that all the Z-9 Artisan sector's residences were uninhabited. Noah mobilized all Z-10 fighters to investigate the Artisan sector. After the fighters departed, however, the command post was surrounded by a mob of common people. Noah ordered the fighters to swiftly take out the Artisans and then return to secure the post. Aletha brought Star-Lord (Peter Quill) to the gathered rebellion in the pastoral pod. Before Quill could even formulate a plan, Aletha announced the arrival of Noah's sky-fighters and asked Quill to bring them down from the sky so her people could overwhelm them. Though Quill urged a peaceful resolution, Aletha swiftly convinced him there was no choice, or Noah's soldiers would kill them all. Quill flew into the air and made one final attempt to reason with a pilot, who blew up his own ship in a failed effort to destroy Star-Lord. 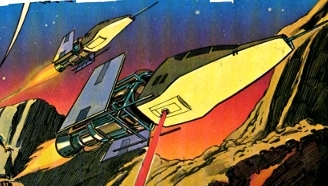 Quill therefore used his Element Gun to disable the ships' laser cannons and force the ships to the ground, where soldiers with laser pistols began blasting the rebels, armed only with sticks and other blunt weapons. Disgusted with the slaughter, Quill put aside his vow of peace and proceeded to blow up each of the ships in the fleet. At the same time, the rebellion swarmed Noah's control center, commanding him Noah to drop the illusion and return to his true form, as they did. Noah surrendered, and the rebels thanked Quill for leading to victory. (Marvel Super Special#10 (fb)) - <According to "Noah"> 3 million years ago, a rain of meteors pounded the race's planet for 40 days. The (surviving?) 2 billion residents made a mass exodus to their space station, where their workers worked to complete the Ark that had been "so long in the making."